New swimming pool at El Karama Eco Lodge. Chemical free, 100% solar driven! The rondavel is a stone and thatch cottage, with a large space allowing for a huge double bed and a single bed. Suitable for small families of friends in a group, the rondavel has space for an additional bed or child's cot. The bathroom is a step outside and overlooks the river. From the deep stone bath guest can watch hippo, black ducks and finfoot passing peacefully in the water. El Karama is centrally situated within Laikipia District, in a 40,000 square km Ewaso ecosystem, that boasts more diversity of fauna and flora than any other region in Kenya. The lodge is based on a private 14,000-acre ranch where conservation is a primary concern. 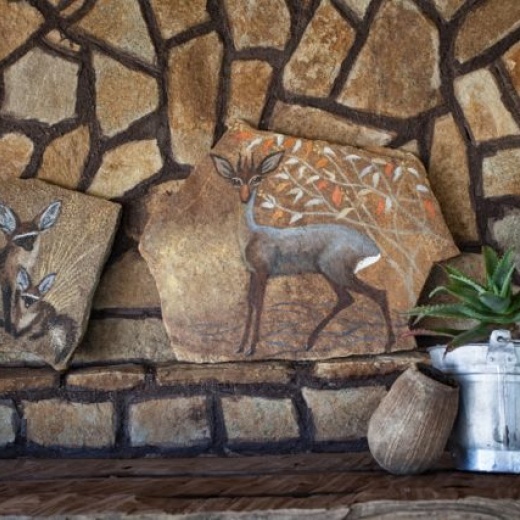 El Karama offers an intimate wilderness experience for the wildlife connoisseur. Guests visiting can expect to see elephant herds, buffalo, lion, leopard, cheetah, hippo, grevy's zebra, genernuk, reticulated giraffe and much more. Bird species here now number over 404 - more than some African countries have! Our intimate, private lodge accommodates for up to 16 people and specialises in looking after groups of between 4 and 16 pax. Guests are hosted by a team of local staff, many of whom built the lodge and have worked on the property for many years. The choice of accommodation ranges from stone/canvas ‘bandas’ and larger spacious cottages for families with children or small groups. All cottages and bandas overlook the Ewaso Nyiro river and the salt lick. The bandas are situated at a safe distance from the rivers' edge and look across to a salt lick where wildlife often congregate in the early morning and evening. Each banda has its own veranda for reading and star gazing. All bandas and cottages have fully powered solar electricity servicing multiple reading lamps, over head lighting and charging points for cameras. The main dining building, open along one side with a peaceful view across the river, is breezy during the day and cosy at night with a massive open fireplace and big comfy sofas. It can easily seat 16. The roof is high, showing off beautiful giant bamboo and thatch and catching the dreamy sound of the river running by. The lodge's friendly chef prepares delicious dishes from the freshest local ingredients most of which is grown in the lodge's organic garden - which guests can visit. There is a fully catered and self-catered option available to guests. The new swimming pool is stunningly built using fallen wood, stones from the property and high reaching thatch roofs that give it all a truly luxurious feeling. The swimming pool is chemical free, using an ECOSMARTE technology for purification and solar energy for cleaning and filtering. The whole area is higher than the main lodge area and looks over the ridge and river making it perfect for sundowners, romantic meals and fireside dinners at night in the new thatched dining room. The owners have set aside toys from their family life for small children and are often on hand to meet clients and share stories of their family life (they have a daughter of 2 years plus). We welcome families with young children and our team of friendly local staff hosting the lodge ensure that they are busy through the day. We can provide an 'ayah' for small children during mealtimes if parents wish to have somebody watch them in the evenings - please ask in advance for this over email. Thoroughly enjoyed our visit to El Karama overall.